Welcome to our beautiful GULF FRONT 2 bedroom 2 bath second floor condo at the Palms. The unit is Water front with a large balcony for a relaxing visit. Watch the dolphins play in the gulf from your huge tiled Gulf front balcony that runs the length of the master bedroom and living room, right on the beach and is as close to the Gulf as the law allows. The living room, dining room, master bedroom all have Gulf front spectacular views of the emerald waters of the Gulf. Free high speed internet is accessible from the living room. This beautiful condo can sleep six. The master bedroom has a king bed and sliding glass doors that go onto to your private Gulf front balcony. The master bedroom has a private bath. There is a second bedroom with twin beds and an adjoining bathroom. The living room has a queen sofa sleeper, TV with a VCR/DVD player, and sliding glass doors to the balcony. The kitchen is large, light and bright, with a breakfast bar and opens up into the dining room. No crowds here! The Palms is a 23 unit complex with covered parking. No waiting for elevators, unless you just want to take it. 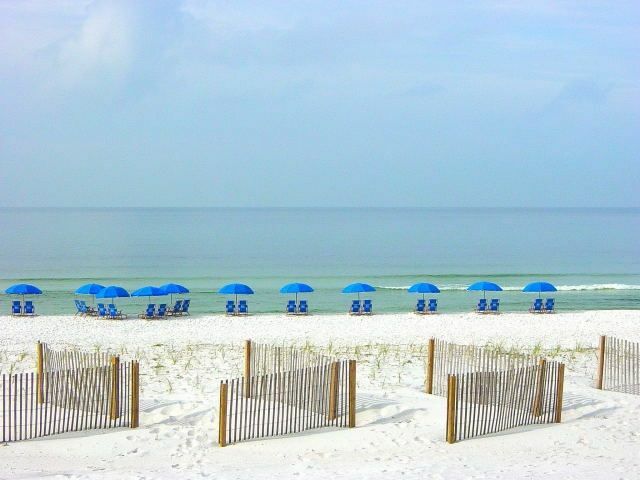 The Palms is on the peaceful Okaloosa Island, a 3 mile stretch of beachfront condos about 6 miles from Destin, but without the crowds and traffic of Destin. My husband and I purchased this unit as a second home and hopefully will retire to the beautiful area within the next few years. We have traveled the world and still say this beach has the prettiest white sand ever seen. We would love to have you visit our second home and you too will understand the attraction of the aqua blue waters and fantastic beaches. Come Visit-you won't be disappointed. Love the area, especially the colors of the water and sand. FWB does not have high rise buildings and traffic congestion, but does offer great dining and activities for all ages. Updated furniture/kitchen appliances, beautiful Gulf Front views, dolphin watching from your balcony. The view was great and we enjoyed use of the property. We had a great time. Our condo was great and very clean. I didn't want to sound negative because we really enjoyed our stay but if I had to give a few suggestions it would be that a few of essentials were lacking (soap, towels & toilet paper). Kathy's condo met all our needs and beyond. From the pics we weren't sure exactly how close to the beach it was, but were so happy to see it was literally a min to get into the beach. The condo was so comfortable for our family of 4. We loved the beach service. It was clean and had couple of spices, sugar and other little things. Beach toys were great. Beds were comfortable. It was close enough that our kids would go back to the condo by themselves while we stayed on the beach. We will definitely be back next year. Thank you Kathy! This condo is perfect for any getaway. You are right on the beach but close to great dining and entertainment. Everything you need is right here! We will be back!